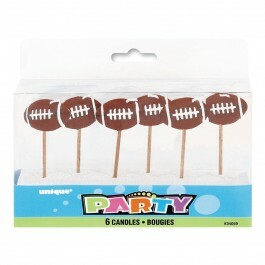 With some great football party ideas you can turn any birthday party into a celebration rivaling any Super Bowl party! 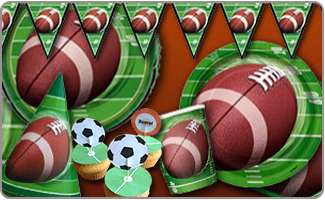 A football birthday party is just the thing to get your sports fan ready to hit the fields. If it is football season when you are planning the football themed party in India, consider looking into what the cost of tickets might be. Even if you don't take the birthday party to a major game, you can still take them to a minor team game that is filled with the action and excitement that all sports fans look forward to. An area recreational center or local park will provide the wide open space you need so that everyone can spread out and play games at the party. The weather might not cooperate and therefore, keep a few football-themed movies on hand; just be sure that they are age appropriate. 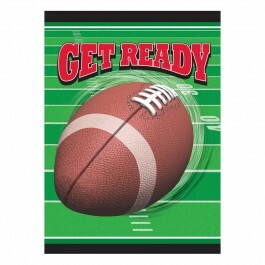 Schedule the party for at least three to four weeks out from the date that football party invitations go out, so that everyone has plenty of time to respond to the invites. 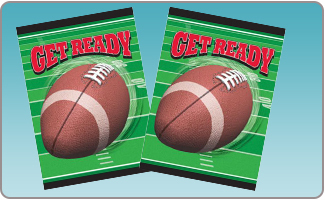 Order our prepackaged football party invitations in India to help you save some time during the planning phase of your party. Get some matching thank-you cards at the same time so that you have them on hand when needed. Attach your invitations to one of our great football party favors, either using a curling ribbon or the clip attached to products like zipper pulls and backpack clips. Add a few football or sports themed stickers, or even some temporary tattoos, with the invitations to get everyone ready for some football! Cut out a football shape from some brown construction paper. Use a glitter glue stick to create the stitching pattern on the ball. Once dried, write your party details on the rear side of the football invitation. Snap a picture of your birthday boy donning his favorite team's jersey. Print out the photos on some photo print paper and write the party details on the backside of the printed photo. No football birthday party would be complete without a rousing game of touch football. Divide the party guests into even teams and let them have at it. Set up a training obstacle course, just like the pros use to get in tip-top shape before a season opener. Print out football-themed coloring pages for the younger party guests to keep busy with. Set up hoops and have the kids practice tossing the old pigskin through the hoops in order to earn points. Pass the football is a fun game that actually uses a water-filled balloon in place of a football. The person who handles the "football" too roughly and causes it to burst will be out of the game until the next round. 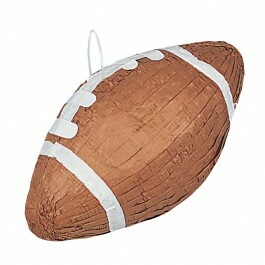 A football Pinata filled with theme candies & goodies makes a fun party game and can double up as a party decoration too. Hamburger sliders and hotdogs are some great football party ideas for food. Set up a station to allow each party guest to put his favorite toppings on. 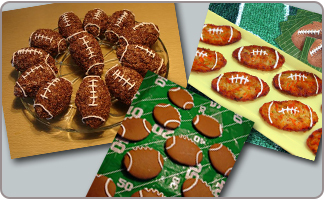 A cake in the shape of a football or any football inspired cake decked up with football pick candles will make an eye catchy & yummy party food. Popcorn and peanuts are traditional football party fare, along with a selection of chips and dips. Make up some team trail mix, using your favorite trail mix ingredients combined with M&Ms in the colors of your birthday boy's favorite team. 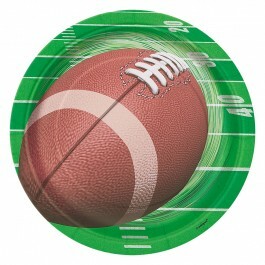 Serve drinks in stadium cups, using crazy straws to add a fun football touch to their drinks. Chicken wings and pizza are some other football party ideas for delicious party nosh. Some simple football trivia can keep your little sports fans proudly displaying their expansive football knowledge! Some fun football return gifts include miniature foam footballs or plush footballs. Backpack clips and zipper pulls in the shape of footballs or football helmets. 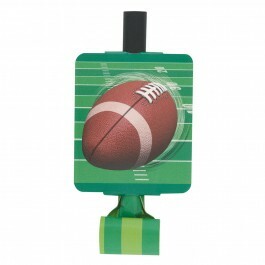 Sports theme notepads, pencils, pencil toppers, and erasers are just the thing your sports fans need. Football blow outs, sticker sheets, and temporary tattoos are all sure to be a hit. Football-shaped candy and chocolates will satisfy their sweet tooth. Cupcakes decorated with football toppers will make cute edible favors. 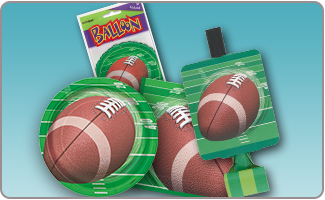 Decorate the party tables with football-shaped confetti and football cards. Choose a color pallet that best suits your child's favor team colors. 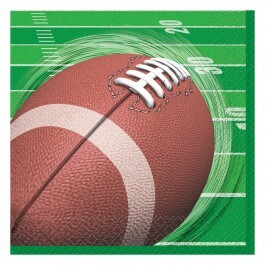 Pick out football party decorations like streamers, table covers, balloons, and cutlery all in these colors. 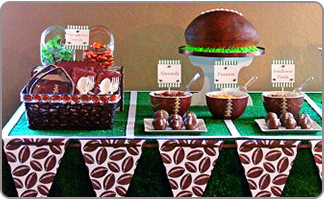 Buy a solid green tablecloth and use white masking tape to mark out yard markers, thereby turning the party table into a fun football field. 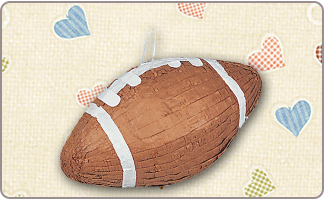 Explore our collection of football party supplies for inexpensive & easy decoration. 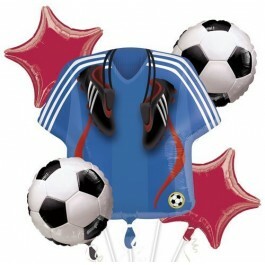 Inflatable goal posts and footballs are some fun football party ideas to include. Decorate the walls of the party space with posters, cut-outs, and vinyl window clings that are in the shape of football helmets, footballs, and your child's favorite team logo. 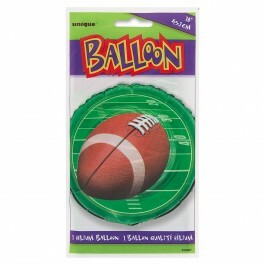 Get some football-shaped Mylar balloons to tie up to your mailbox and mark the party spot.